Sometimes Ray and I have interesting conversations late at night as we’re laying in bed to go to sleep. Last night was a prime example. The entire thing started because yesterday Ray, I, and our daughters Heather and Leah went to see the new Spiderman movie (regular version, not 3D). In the movie, Peter Parker’s father’s former partner, Dr. Curt Connor of Oscorp, injects himself with a chemical he’s been experimenting with on defective lab animals, to try to grow his amputated arm and hand. Instead, it turns him into a super-power, evil lizard. “The Lizard” is bent on spraying the city of New York with a biological weapon of this chemical, creating the people into super-power, ferocious lizards, too. Peter finds the home of The Lizard by noticing that the little green lizards in the city are going into the sewer, and he as “Spiderman” goes down there to fight it. These lizards in the movie reminded me of lizards in the south. 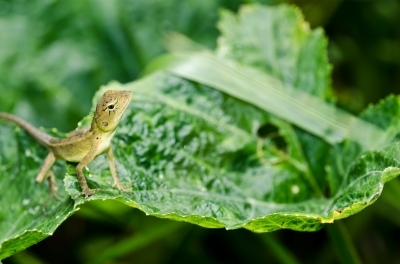 I don’t know if these lizards were chameleons, geckos, or anoles, but they could change color. This is what I was talking to Ray about last night, and then he told me two incredible, hilarious stories from his childhood. My mother used to be terrified of these lizards. It would send us four kids into gales of laughter when we saw our big mama running when she saw one or climbing on a kitchen chair. She’d scream, “KILL IT, Leland!” Daddy would shake his head and smile at her silly fear, saying, “Oh, it’s not going to hurt a thing!” He then proceeded to brush it outside with the broom or with a stick from outside. My brothers Greg and Herbert (Herbert is affectionately known as “Bubba”; a lot of brothers in the south are called “Bubba”) liked to play with the lizards. Greg would pick one up that had found its way on our back porch to scare mama with it, and the tail would break off, a defense mechanism from predators. (The tails may grow back.) Mama would scream, we’d laugh, and Greg or daddy would force it outside to “rescue” mama. While I don’t really care for reptiles, I wasn’t scared of the lizards and became accustomed to seeing them on our back porch, staring at them curiously and the lizards looking back at me with just as much interest. They actually look quite intelligent. It fascinated me that their scaly skin could turn from emerald green to leaf-brown, and back again, and that the tail could snap off and grow again. After I shared my lizard story, Ray then felt prompted to one-up me as he often does. I wouldn’t believe these incredible stories, if it weren’t for the fact that I’ve been married to this man for 19 years and know his behavior can be odd at times. Plus, I have seen him pick up snakes for fun and to impress our kids, so I know he does it. Ray grew up in Louisiana and Texas, where fascinating critters abound. 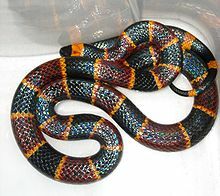 When Ray was about five years old, his friends dared him to pick up the “pretty colored” coral snake. Can we say DEADLY? Ray knew it was poisonous, but what a better way to gain a reputation with his friends as macho. He picked one up by the tail, and wrapped it around his arm, somehow getting the snake to bite its own tail. Surely God’s angels surrounded Ray as a child. The coral snake has one of the most potent venoms of any North American snakes, with a neurotoxin that can paralyze breathing muscles, causing respiratory failure within hours! Little Ray ran with his “coral snake bracelet” to proudly show his mother who was inside the house, trying to get a moment’s peace from her hyperactive ADD child. When Ray showed it to her, she freaked out and screamed at him to PUT THE POISONOUS SNAKE DOWN RIGHT THIS MINUTE! Ray and his friends, not content with this being a one-time event, tried it a couple more times. I commented that it’s a wonder Ray’s mother survived his childhood, and Ray dryly replied it’s a wonder HE survived it. As a child, Ray often entertained himself by capturing critters. One he enjoyed playing with was the bumble bee. He’d heard that if you get a leather belt and spit on the inside of it, you could rub the belly of a bumble bee with the rough wet hide, the bee woudl get mad and try to sting, and its stinger would fall out. Then you could play with the bumble bee without getting stung. Ray said that he would do this and sometimes he even tied string around its belly to make it fly in a circle like an airplane. Oh my gosh. Last night I laughed and laughed at this image. I can definitely see Ray doing something like this. 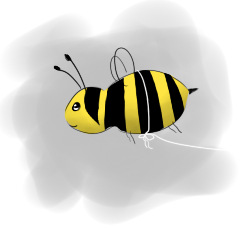 I asked Leah to draw a picture of a bumble bee on her graphic art tablet this morning, with the string around it. She whipped it up quickly for me. Isn’t it cute? She’s such a great artist! One time Ray caught a bumble bee and he was curious to know if the stinger would still sting if it wasn’t in the bee. So he touched it to see. Of course, the stinger did still work, and he ran crying to his mom, and told her that his “friend” had stung him. Eventually he had to ‘fess up and tell the whole story. From that point on, Ray was invincible. He began deliberately catching bees and hornets, stirring up their nests to tease them, letting them sting him in his hands. Apparently he’s not allergic to them like I am. As a child, I was stung once on the bare foot by a bumble bee, and my foot swelled up to twice its size. Terrified of Leah or me being stung, I cautiously snuck to the bottom cabinet to get out the spray insect killer, and sprayed G.I. Jane-like at it from across the room, a dozen times. Finally the wasp, drunk on the potion, laid on the floor a minute, and I pounced on it with the fly swatter, hitting it over and over to make sure it was really dead. Then I grabbed a handful of napkins to gather up its body parts, to make sure I wouldn’t be accidentally stung and threw it away in a plastic bag in the trash. I know you may be wondering what’s the point of this blog post…if there IS one. Yes. It’s this: sometimes our enemy Satan attacks us with either real or perceived dangers. We can be intimidated with imagined fears and overreact like my mother, screaming and climbing on a chair to get away from something basically harmless, like the lizards. Or we can walk in ignorance that there are spiritual traps, like Ray wrapping a coral snake around his wrist as a bracelet, or playing with bumblebees. We need to use wisdom to know the difference each day, being alert to Satan’s dangerous weapons of warfare. To learn more about spiritual warfare, check out my ebook The Hands Of A Woman: Everyday Women In Everyday Battles. Well, guess Ray and I shouldn’t have our conversations at 2 a.m, lol…. Oh my gosh! That is scary about the cottonmouth, too. Ray probably DID touch it! Him and his snake stories, LOL! I don’t know how you made it through his antics. Ray is STILL very busy….but I think quieter now. 🙂 Yes, he is a wonderful loving man….that is, as long as he doesn’t bring ME home any snakes, haha. Oh, okay, don’t feel so senile now. Actually, my mom went after my new friend with a hoe. The carnage scarred me for life. Ray, I’m sure that your grandmother Fort said the same thing about the coral snake and your mother said the same thing about the rattlesnake: “PUT THE POISONOUS SNAKE DOWN RIGHT NOW!” LOL. I must have been half conscious when we discussed this. The coral snake story occurred during a summer visit to my grandmother Fort. My mom has a different snake story involving a rattlesnake.